Look, Mom, spring is here! 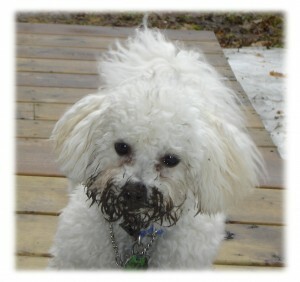 If there’s mud to be found no one will find it quicker than kids and puppies! Just look at Cookie, so sweet and innocent. She didn’t even know that she was a muddy puppy. She’s adorable even when she’s Muddy Puppy. However, we quickly scooped her up and headed for the bath! Ahh, poor Muddy Puppy, had to have a bath. Can you see the colour of the water? 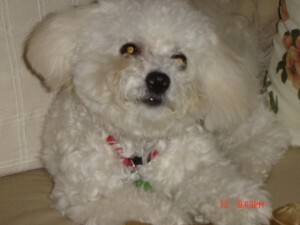 It was really funny watching her wiggle, jiggle and shake to shed the water from her now snowy white fur. Her little tail always does one last jiggle, all by itself…so cute! Here’s Cookie in the “After” picture. No more Muddy Puppy…for today, anyway!